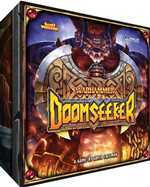 Doomseeker is a card game for 2-4 players, where you assume the role of a Slayer and immerse yourself in his quest throughout the Old World to find a worthy death. You will slay many foes, hoard gold, and purchase deadly new weapons. If you are lucky, you will find your death at the hands of an epic and terrible foe. During your quest, your Slayer will earn renown through slaying dooms and satisfying grudges. At the end of the game, the Slayer (dead or alive) that earned the most renown wins the game! Brahm is a brutal Scandinavian metal-head, with an in-your-face aggressive nature. His deck can consist of three technique from the Hard style, and his ability allows him to suffer 1 damage in order to give his attacks Chain 1. Brahm is able to turn the Hard style in a combo heavy fighting form, at a cost. His mode action, Ragnar-Rock, makes it so that opponents no longer cancel his actions when he is damaged, but the tradeoff is that it prevents him from blocking. Brahm?s Valhalla Block allows him to recover health that he may have willing suffered for those high damage combos. Health management is a key feature to Brahm playstyle. Cobalt, an Argentinian and elite ex-commando for the Red Star Committee, has a cybernetic arm that she uses to reposition and strike at her opponents from both near and far. This is represented best with blast actions that only last until the end of the challenge phase. For example when Dragging Hook?s blast token hits a retreating opponent, Cobalt pulls the the opponent towards her space. Grappling Thrust on the other hand, will pull Cobalt closer to the opponent when they are hit by its blast token. 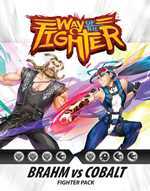 The Brahm vs Cobalt fighter pack also comes with two sets of actions from the Push technique and Slam technique. The Push technique from the Hard style provides powerful attacks that push their target away, making it ideal for fighters wishing to distance themselves from an aggressive opponent. The Slam technique is one of the most physical sets of actions from the Fluid style that uses momentum to control the opponent?s position in the arena. Khublai is by far a larger than life character both metaphorically and physically. A giant of a man, boisterous, and a hero of this people, he is the quintessential Mongolian wrestler; powerful, more agile, and faster than he should be. Khublai?s weight and size prevents him from jumping very high. In game terms, this is represented by his inability to use the Leap command along with ignoring effects that move him to a jumping position on his actions, making him a huge and static target. He overcomes this hindrance with a powerful effect that allows him to ignore the first point of damage dealt to him each turn. This ability to ignore low damage and his utmost mastery of wrestling techniques, makes him a terror at close range. He controls the board with cards like Unmovable Block and Giant of Bokh. Khublai is a mountain that will crush any opponent that gets within his melee range. Horse Spirit, Ultimate Mekh, and Massive Chop are great options for overcoming his inability to leap with their small burst of speed. Learning how to overcome his inability to leap by playing powerful actions such as these that close the distance between him and his opponent is pivotal to winning with the Mongolian giant. In contrast, Wattana is small in stature and quiet, but under her serious and brooding demeanor exists an inextinguishable fiery champion. Her bone-crunching Muay Thai techniques are debilitating to the extreme. Her rigorous discipline and training unlocked some her inner phoenix, making her chi surrounding her appear as burning flames. She has very little movement options, and even the Command on her fighter ability encourages her to remain in place. That said, a simple Priority Bonus 2 with a fighter who makes use of hard style attacks is a huge threat, as it compensates for the main flaw of low priority values that come from heavy attacks. Moreover, her access to Chi Actions gives her some zoning control. Her two blasts, Flaming Strike and Phoenix Wings, are frustrating thanks to their Drain effect. Plummeting Elbow is a complete denier, in particular with damage boosting moves or modes. Twin Rising Uppercut is very unique with the ability to make two powerful attacks in a row, serving as the perfect response to weaker blocks. Her mode Art of Eight Limbs is great for building some power dice while also remaining steadfast. The Khublai vs Wattana fighter pack also comes with two sets of actions. The Brutal technique from the Hard style is a simple technique composed of slow attacks with very high damage output. Use Shattering Strike to set up for a follow-up that is guaranteed to cancel cowardly blocks. The Lock technique from the Wrestle style includes grapple attacks equipped with Trash effects that destroy the opponent?s hand. This technique also compliments Severina?s hand denial game. Just swap it out with one of the other wrestle techniques from the Turbo set to generate a deadly hand destruction deck. 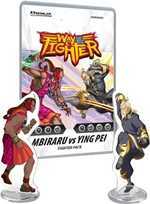 This fighter pack includes a complete set of actions for Mbiraru and Ying Pei, along with their fighter standees. In addition to the two new fighters, this pack includes two complete sets of actions for the Choke technique belonging to the Wrestle style and the External technique belonging to the Chi style. Over a period of twelve intense turns, each player will control a fighter?s movement, manage the fighter?s energy, and decide on what actions to have the fighter perform against the opposing challenger. The game continues until one fighter is knocked out, or the time runs out; at which point one fighter will be declared the Champion! Tala is a well-balanced native american warrior aided by the animal spirits in nature. She has a very unique ability on her character card which allows her to increase the utility in each of her attacks. The core of Tala's playstyle comes from her ability to be able to add secondary effects from her fighter cards to any cards she plays. This provides her with two significant advantages: first, adding more secondary effects obviously can make cards stronger in new unpredictable ways, second, she can change an action?s effect after revealing them, allowing her to react appropriately to an unexpected turn of events. All of her fighter actions will be sure to find a use one way or another. Her mode Totemic Strength and her block, both compliment her playstyle, by allowing her to dig for fighter cards in her deck and return those that she has discarded. Due to the decisions that are presented when determining to discard cards for their effect or holding on to them to be used as an action, Tala is somewhat harder to master than the other fighters. Victoria is a british-born aristocrat adopted into a clan of assassins, and currently Severina?s most trusted advisor. With three soft style techniques to choose from, Victoria is speed and grace incarnate. The ability on her character card compliments the strong combo heavy nature of the soft style. Her psychic energy shurikens and kunai, along with the use of chi techniques, gives her just the right amount of ranged control. Moreover, her Kawarimi Block and Flickering Image actions give her the Traverse effect allowing her to instantly escape move or vanish, in a true ninja fashion. Her origins can be shown in Noblesse Oblige, which can double as a second copy of the Initiative Card, and Spiffing Kick is a brutally painful attack that will deplete your opponent's hand. Her truly special attack is Touch of Death, a very close limited but deadly attack. The Tala vs Victoria Fighter Pack also comes with two sets of actions. The Pain technique from the Soft style is composed of a subtle array of options around the Trash effect, denying your opponent that perfect hand. The Internal technique from the Chi style brings more denial and versatility, along with high and low blasts, to any chi fighter?s deck. 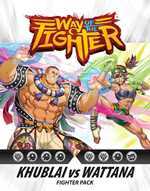 Way of the Fighter: SUPER includes five fighters: Ren, Jun, El Falcon, Alberdus, and Aurelia. Players can build their deck from multiple card techniques, allowing them to customize their favorite fighter to fit a play style that best suits them. Combining Way of the Fighter Super with Way of the Fighter Turbo allows you to tag in two more players for even more action. Way of the Fighter: Turbo includes five fighters: D?Shaun, Lumi, Faris, Kasi, and Severina. Players can build their deck from multiple card techniques, allowing them to customize their favorite fighter to fit a play style that best suits them. Combining Way of the Fighter Turbo with Way of the Fighter Super allows you to tag in two more players for even more action.